This morning I went into the front yard to water a few flowers, only to be met by a distracting cacophony. Several squirrels had situated themselves on the branches of the enormous oak tree that dwarfs my little cottage home. They were squawking at each other like nobody’s business. What a beautiful thing, to be held high and protected by such enormous branches even in the midst of their disturbance. It made me think of the gentle, constant presence of God in my life, even when I am fixated on some concern or another, tempted to lose myself in the drama du jour. As I work now in my office, the broad long branches of this oak shield my home, even as they reach up and outward toward my neighbors. In this regard, they are more consistently neighborly than am I. 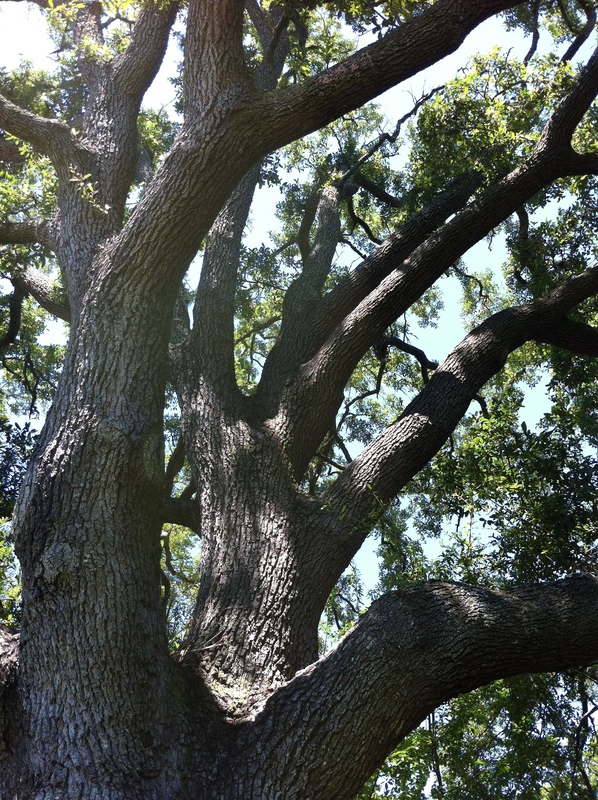 The oak or the terebinth was considered sacred by many – a place where God might be encountered. The Lord appeared to Abraham by the oaks of Mamre. Abraham saw three men there and bowed down to them. Many say that this alludes to the Trinity, though most scholars suggest it refers to the Lord who is accompanied by two angels. I have no interest in entering a debate. What matters is that God comes to us. Even today God comes to us; this is the reality that interests me greatly. Tomorrow our “church without walls” will gather once again in our shady patch at the edge of a downtown parking lot. Our spot is situated along a several-block corridor formed between tall buildings, so that a breeze most always is produced. There is a scientific explanation for this but I also know that the Holy Spirit is with us. As we celebrate Trinity Sunday tomorrow, we will welcome the persons of God. We will offer our own halting hospitality. We will offer ourselves, our stories and our hearts. We will bless the bread and the fruit of the vine. We will share Holy Communion and a picnic lunch, as we give thanks that God is surely taking rest with us under the trees. This entry was posted in Christianity, congregational development, faith, Grace, peace, Uncategorized, unity and tagged Christianity, church planting, church without walls, community, grace, healing, holy ground, hope, mercy, radical hospitality, street ministry, Trinity Sunday, vulnerability. Bookmark the permalink. 2 Responses to By the oaks.